I wish I could tell you that I haven’t posted in a while because I have been so wrapped up watching the World Cup. If I were to say that, I would definitely earn some points in The Hub’s book. He literally has the schedule memorized, has installed I don’t know how many new apps on his phone to track scores and standings, and cut our San Diego getaway weekend short because he had to be back home to watch France’s first game. Never mind that the hotel had a gazillion TVs – all of which were tuned to the World Cup. Nope, there’s something special, I guess, about watching it in a fellow Frenchman’s living room with 15+ other screaming and cheering Frogs. The Cup Mania is so intense with him this year, that he went so far as to order cable. The family who hasn’t had cable in over 6 years, whose children don’t really even know what cable is, now have it just so one man can watch grown adults kick a ball around. The upside for me? Shhhhhhhhhhhhh, don’t say it too loudly, but with cable also comes the Food Network. I literally feel like I am on a permanent vacation. I can watch the Food Network whenever I want . . . . not just when traveling and staying in hotels. So the small people in this house may be a bit impressed by the World Cup thing, but they are now INFECTED with the Food Network. The Medium Little One has taken to critiquing every meal I put on the table a la Geoffrey Zakarian. Just today the Little Little One was playing in her pretend kitchen and asked me how many minutes she had left on the clock. And the Big Little One is trying to figure out how we could have a Chopped Party with a couple other families using only one kitchen. There you have it, the highlight of our Summer so far: A father obsessed with soccer, a mother obsessed with food, and kids just newly exposed to cable trying to navigate the thrill of it all. Yet, none of this should overshadow the thrill of the family’s newly acquired vegetable spiralizer. 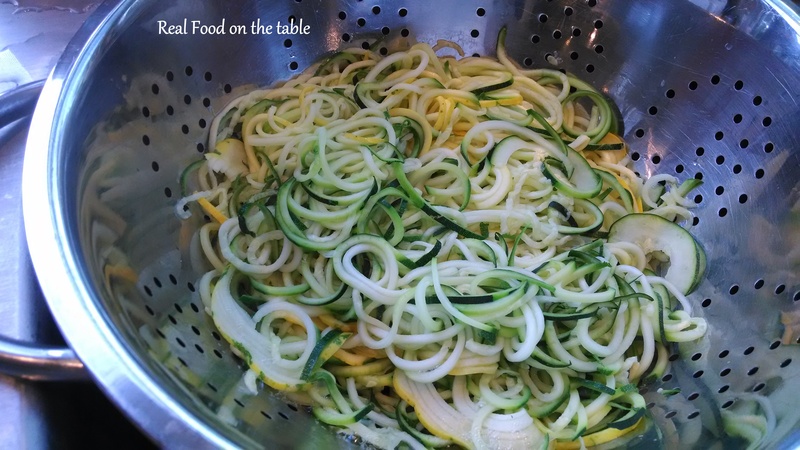 I am a spiralizing fool! Don’t stand in my kitchen too long or you might find an appendage starting to spontaneously ribbon off. 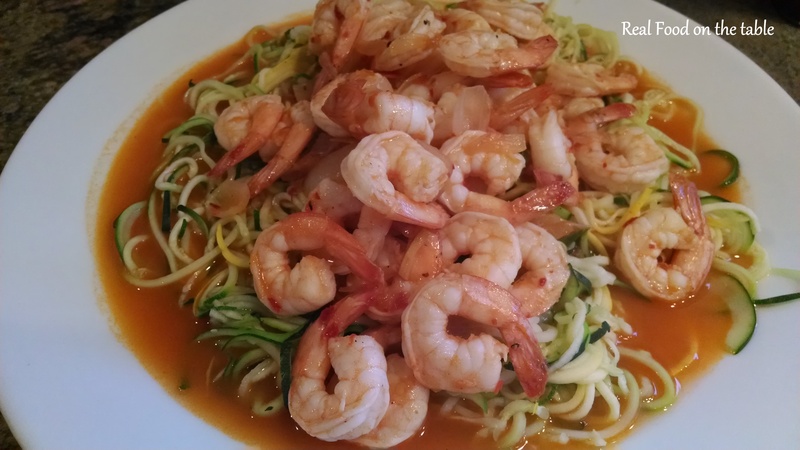 A recent creation with the spiralizer was this Sriracha Shrimp Over Zucchini Pasta. 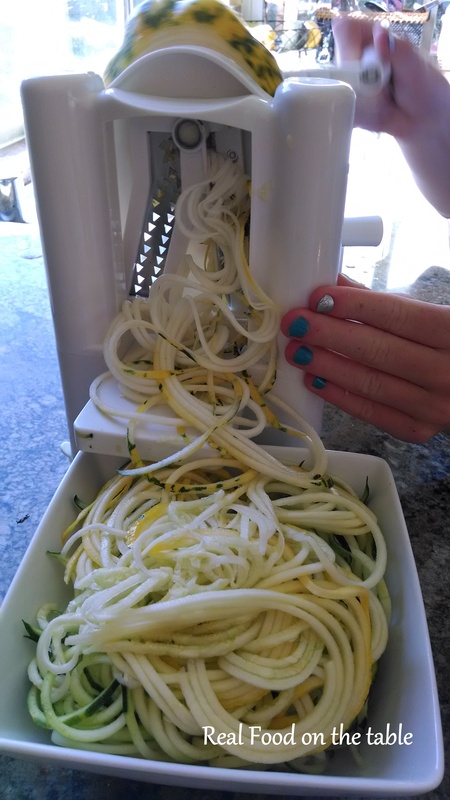 I started by spiralizing about 3 medium large zucchini. The little hands just love to help with this part. Then I spread the spiralized zucchini out on a couple of layers of paper towels, sprinkled with salt, and let them sit for about 5 minutes. This helps to release excess liquid so you don’t end up with a soggy mess. 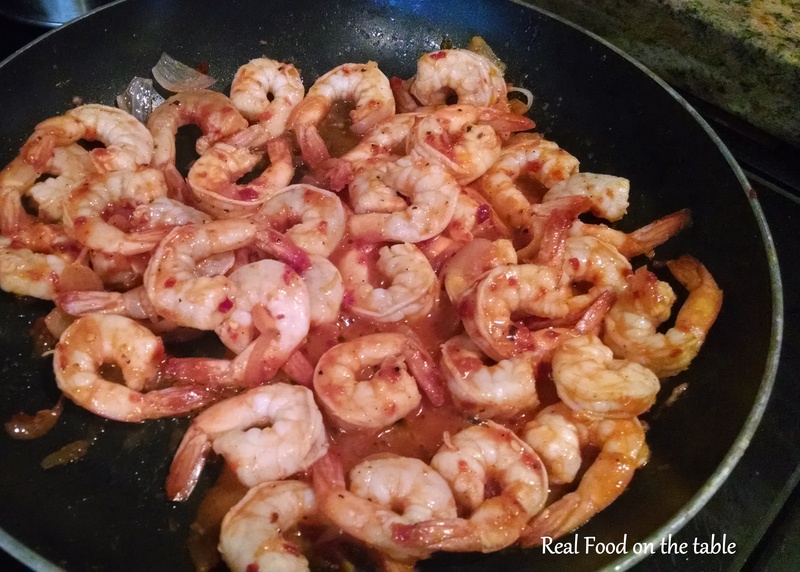 While the “noodles” were basking on the paper towel, I put a pot of water on to boil and set to work on the shrimp. 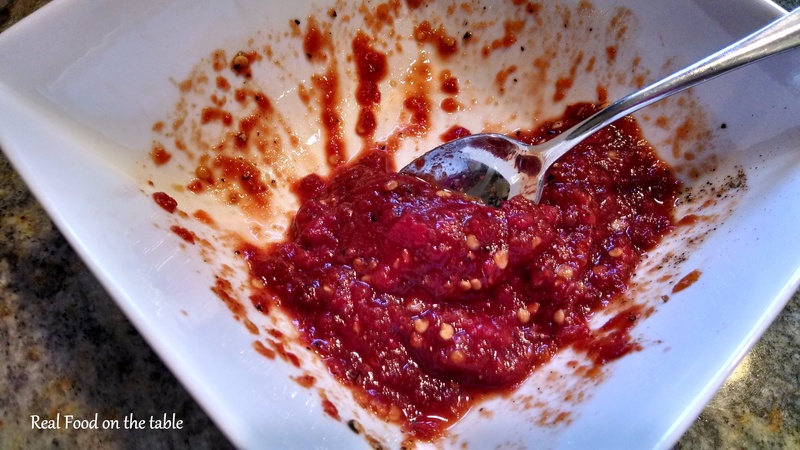 I mixed my Sriracha sauce, tomato paste, brown sugar and salt and pepper in a little bowl. I warmed some olive oil in a large skillet and sauteed up some chopped shallots. I added in the Sriracha mixture and my shrimp. I let it cook until the shrimp was just pink. I tossed my zucchini noodles in my pot of boiling water for 1 minute. Yep, only 1 minute. Any longer and you will have mush. I drained the noodles and reserved a bit of the cooking water. I added some butter and a bit of the reserved cooking liquid to my shrimp and then placed the noodles on a platter and crowned them with the shrimp. 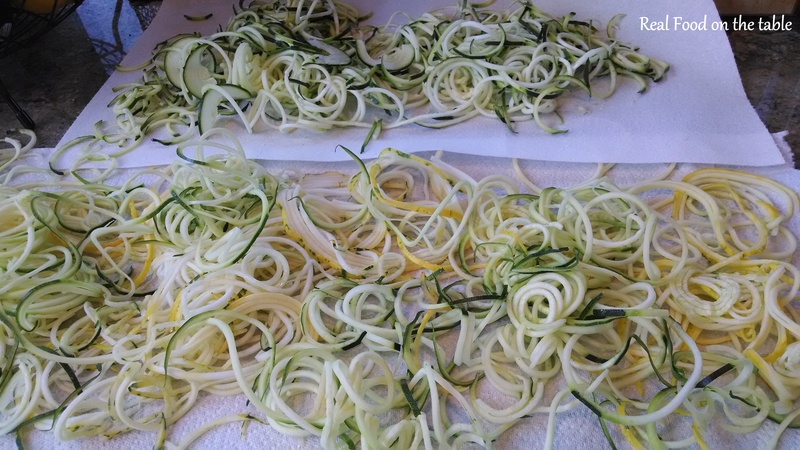 I guess some people call these lovely little zucchini noodles Zoodles. I prefer to just call them noodles and my kiddos are none the wiser. Luckily for me, I wasn’t chopped after serving this for dinner. I think they kind of know that they’ll starve should they ever decide to “chop” me. Here’s the complete recipe for Sriracha Shrimp Over Zucchini Noodles.